If you’d like to decorate your apartment for the fall season but you don’t want to make a huge commitment or spend a lot of money (Christmas is right around the corner, after all), then a fall wreath is perfect. They are easy to make, inexpensive, and there are so many natural elements available this time of year: fallen branches, acorns, colorful leaves, feathers, etc. And wreaths aren’t just for the front door – hang one above the fireplace, on the wall behind the couch, or in your entryway above a small table. Next, gather materials. You’ll need scissors, hot glue, florist wire, florist tape, ribbons, and whatever you want to decorate with: acorns, pinecones, fresh or silk flowers, small pumpkins (real or fake), colorful leaves, feathers, etc. You may want to use spray paint, glitter, craft glue, lace, etc. – use your imagination. Some items may need some attention before you use them. If you use acorns, hazelnuts, or any other nut you’ve gathered yourself, be sure to wash them, pat them dry, and put them in the oven at 350 degrees for 10-15 minutes, just to kill anything that might be living inside. To keep your leaves from becoming brittle, you may want to preserve them before making your wreath. There are many ways to do this – glycerin and water, hot wax, decoupage – but the easiest method is by microwave (the leaves must be fresh – not dried out). Watching very carefully (the leaves can catch fire! ), arrange the leaves on paper towels and lay another towel over the top, sandwiching the leaves between. Microwave for about 30 seconds, then for 5 seconds at a time until the leaves are dried but not scorched. Leaves that curl weren’t microwaved long enough. Let the leaves sit for a couple of days, then spray them with acrylic sealant on both sides. If you want to paint items, such as the acorns or pinecones, do this a day or two before making your wreath to give them plenty of time to dry. 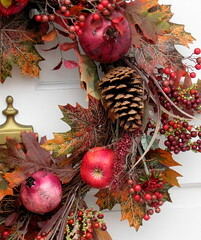 There are no rules – if you want lime green acorns and silver pinecones – it’s your wreath. Now, start covering your wreath form. You can use hot glue to add items, florist tape and wire, or a variety of methods – whatever works best. You don’t want the tape and wire to show – if it does, add another layer to cover it. If you are using a wire hanger, foam, or florist base for your wreath form, you want to cover it densely so it doesn’t show. If you are using a grapevine wreath, it’s pretty enough to show through – some people choose to leave most of the grapevine wreath uncovered, only adding decorations to the side or bottom. What you choose to use can range from a wreath covered completely in hazelnuts with just a simple bow at the top to a collage of vibrant leaves, feathers, flowers, acorns, and pinecones covered in glitter. Now, hang your wreath, stand back, and enjoy!